Roland V-Combo VR-09: the one-stop solution for the gigging keyboard player? 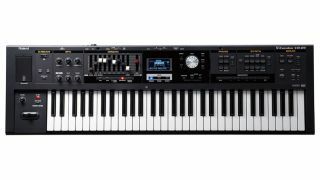 NAMM 2013: If you're looking for a stage keyboard that covers a wide range of sonic bases, Roland thinks that it has just the thing in the shape of the V-Combo VR-09. The dedicated piano, organ and synth engines are divided into blocks on the front panel, with each one offering its own set of real-time controls. There are effects, too, plus a looper and a selection of built-in rhythm patterns. The V-Combo VR-09's details are availlable on the Roland Connect website or down below. Price and release date are TBC. If you're a gigging keyboard player, you'll be looking for at least three things from your next keyboard. First, you'll need a diverse range of convincing sounds to help you get the gigs. Secondly, you'll want to be able to edit sounds quickly when on stage, should you need to. Thirdly, you'd like to tuck the keyboard under your arm after the gig and drive home. The Roland V-Combo VR-09 keyboard is an affordable, easy-to-transport rig (weighing just 5 kg) for performing keyboard players, with dedicated piano, organ, and synth engines containing essential tones for live use.The three sound enginesare organised in three intuitive blocks on the front panel—giving fast access to the sounds you need and especially useful on a dark stage. The VR-09 is all about controlling your sound too, with nine sliders for tone shaping and a large array of knobs and buttons for tweaking the seven simultaneous effects and various parameters. Other great additions include an onboard looper and a drum section packed with rhythms for practice and jamming. The V-Combo VR-09 was designed with the needs of live players in mind. An intuitive front-panel layout and clear LCD screen lets you quickly select Roland's flagship piano, organ, and synth sounds along with plenty of real-time controls for expressive tone manipulation. The seven simultaneous effects - rotary, delay, reverb, tone, overdrive, compressor, and a customisable MFX section - have dedicated knobs that tweak multiple parameters with a single twist for powerful sound shaping with minimal effort. The smart interface makes it simple to set up splits and layers on the fly, and to save all your keyboard settings in the user memory for instant recall on stage. Piano is a cornerstone sound for live playing, and the V-Combo VR-09 is filled with a wide selection covering all musical styles. The gorgeous acoustic grand piano features 88-note stereo multi-sampling, delivering pro-level piano sound that rivals Roland's dedicated stage pianos. Many popular vintage E. Piano sounds are onboard as well, along with complimentary effects such as vintage phaser and tremolo. The compressor—accessible via a dedicated, easy-to-reach knob—transparently boosts the level of the piano sounds, ensuring that your playing always cuts through when performing in loud bands. Roland's SuperNATURAL technology powers the V-Combo VR-09's classic tonewheel organs, while nine harmonic bars provide authentic real-time performance control. A newly developed transistor-type organ is also included, offering the unique sound of combo instruments from the 1960s. The 61-note keyboard has an extremely fast response, perfect for essential organ techniques such as trill, sputter, glissando, and percussive hits. Rotary speaker and amp simulators reproduce the characteristics of vintage organ speaker cabinets and overdriven tube circuits with astounding realism, while a new "Twin Rotary" option delivers a deep, aggressive effect never before heard. The V-Combo VR-09 is packed with ready-to-play synthesizer sounds, from vintage analogue classics like JUNO strings and '80s synth brass to textured, modern-era digital tones and beyond. Front-panel controllers allow you to tweak the synth tones intuitively in real time, including convenient ADSR and cutoff/resonance adjustment with the harmonic bars from the ORGAN block. Effects like "Bit Crash" let you get your hands dirty by creating authentic, relevant sounds for current dance music genres, including Dubstep. The free VR-09 Editor app for iPad gives you powerful, intuitive control of the organ and synth sound engines via youriPad's full-colour touchscreen interface. Quickly edit organ sounds and customise vintage tonewheel characteristics such as leakage, click noise, and rotary speed, and easily access synth sounds to build custom tones and layers. After tweaking sounds at home, you can take your iPad to the gig and use the app for extra real-time control on stage. Convenient, cable-free communication between the V-Combo VR-09 and iPad is simple to set up with Roland Wireless Connect. You can also link up with a USB cable via Apple's iPad Camera Connection Kit.